WHALE Arts is delighted to announce that for 2018 the Scottish Poetry Library (SPL) will be running a flagship residency project in Wester Hailes in partnership with Open Book. This exciting pilot project has emerged from WHALE’s Creative, Connected, Community Project supported by the Big Lottery which has a focus on creative placemaking in Wester Hailes. The Creative, Connected, Community project aims to engage the different neighbourhoods that make up Wester Hailes in creative activities and workshops, commission public artworks made with and for the community and coordinate community wide events around the 50th anniversary of Wester Hailes in 2019. 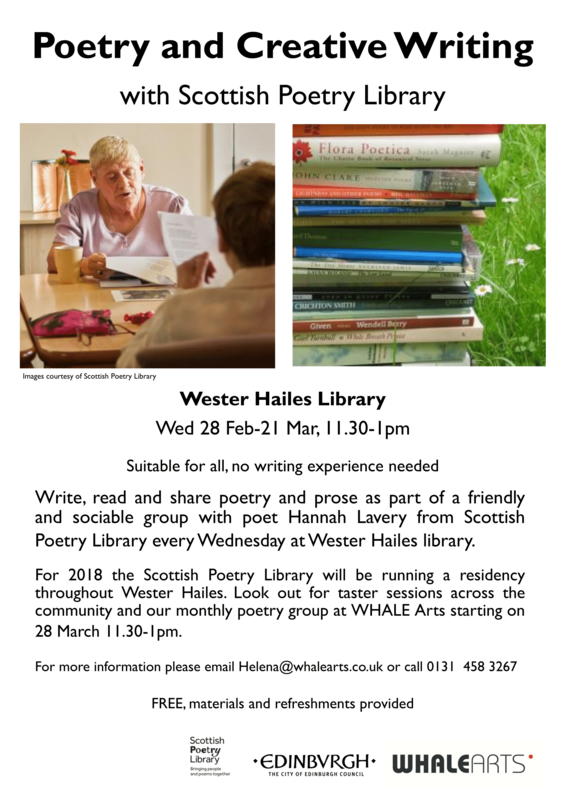 The partnership with SPL is an excellent opportunity for the community of Wester Hailes to participate in poetry, creative writing and shared reading activities and explore their environment and place through writing. The project builds on a legacy of poetry written in and about Wester Hailes. The residency will include taster sessions with local community groups and partners; a four week creative writing block at Wester Hailes Library; and monthly poetry groups at WHALE Arts. Groups and writing workshops will support health and well-being. As well as writing groups we hope to develop an anthology of poetry and prose written by local people, visit the Scottish Poetry Library and hold a community-wide public poetry event. Our first four week block of poetry and creative writing starts at Wester Hailes Library on 28 February – 21 March 2018, every Wednesday from 11.30am – 1pm. This is a great opportunity to join a friendly group to read, write and share poetry and creative writing. No writing experience is necessary and activities will be suitable for all. The monthly poetry group at WHALE Arts will begin on 28 March 2018 and take place on the last Wednesday of the month there after. Please contact Arts Engagement Manager (Adults) Meghan Bidwell via info@whalearts.co.uk to learn more about this group.